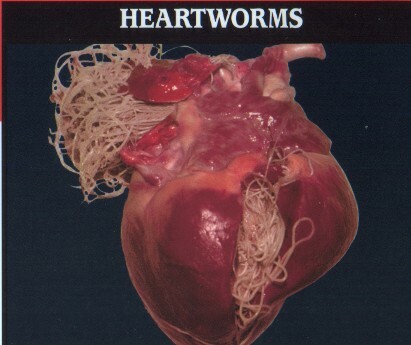 Heartworms are parasitic worms that live inside the heart, lungs, and major blood vessels of dogs and cats. They are transmitted by mosquitoes when they bite. They can lead to heart disease and even death if left untreated, and typical signs include coughing, shortness of breath, labored breathing and reduced tolerance for exercise. However, many dogs will show no signs of illness in the early stages of infection. Heartworm disease is treatable in most cases, but more importantly, it's preventable! Because of our coastal climate, about 90% of dogs in the Houston area will contract heartworms if not on a monthly preventive. That is why it is important to give your dog a monthly preventive year-round and have your dog tested yearly. Heartworms can also be transmitted to cats. About 10% of cats in the Houston area will get heartworms if not on a preventive. Unfortunately, it is much more difficult to test cats, and impossible to treat. Yet, the symptoms can be very severe, including sudden death. That is why monthly prevention is the ONLY way to ensure your cat does not contract heartworms.